Enda Kenny's in-tray is full of horrors. First up, on Monday, were keenly awaited mortgage arrears figures which showed 10% of homeowners are now struggling to pay. New mortgage arrears figures released on Monday by the Central Bank show 6% of the country's households are now in mortgage arrears – 44,508 homeowners have not made a monthly payment for more than 90 days. This compares with 28,603 in arrears the previous year to the end of December 2009. Worse – there are a further 35,205 who have done private deals with banks – to pay interest only, get mortgage holidays etc. That's 80,000 in total who are in arrears or have restructured mortgages, meaning 10% of the total mortgage population are in trouble. These figures will be a cold shower for Kenny and his team, because they underline how real the prospect of a second wave of debt default is, something economist Morgan Kelly predicted last year when he suggested 19th century-style social revolt from the middle-classes. According to Nomura a halt in just Libyan and Algerian oil production (far more likely than the crisis spilling over to Saudi) would send oil to over $220/bbl. Specifically "the closest comparison to the current MENA unrest is the 1990-91 Gulf War. If Libya and Algeria were to halt oil production together, prices could peak above US$220/bbl and OPEC spare capacity will be reduced to 2.1mmbbl/d, similar to levels seen during the Gulf war and when prices hit US$147/bbl in 2008." Wouldn't a doubling in price lead to a major demand plunge as well? Yes it would "This could also result in a temporary demand destruction of some 2.0mmbbl/d globally." Also, since the Fed's free money was not flooding global market last time, $220 is just a lowball estimate: "We could be underestimating this as speculative activities were largely not present in 1990-91." According to Capital Economics, a research firm in London the next trouble spot could be Venezuela. “There is a growing risk that the government will default on its obligations in 2012,” its analysts wrote on February 17th. Some in the markets have taken fright, too: the country’s credit-default swaps imply a 50% chance of default by 2015. That may be overblown. Even so, Hugo Chávez, Venezuela’s leftist president, seems to be pulling off a dubious achievement by causing the bond markets to fear for the solvency of the world’s eighth-largest oil producer. The chief cause of Venezuela’s travails has been Mr Chávez’s pillaging of PDVSA, the state oil firm. He has packed it with loyalists, starved it of investment and used it for social spending, cutting its output from 3.3m barrels per day (b/d) in 1998 to around 2.25m b/d, according to industry estimates. Of that, some 1m b/d is sold at subsidised prices at home or to regional allies, leaving just 1.25m b/d for full-price exports. Meanwhile, the president’s hostility to business has devastated the rest of the economy. He has nationalised hundreds of companies and trumped up charges against their owners, causing much of Venezuela’s private sector to shut up shop and flee. As a result, the country has seen vast capital flight, and must import many goods that it used to produce. 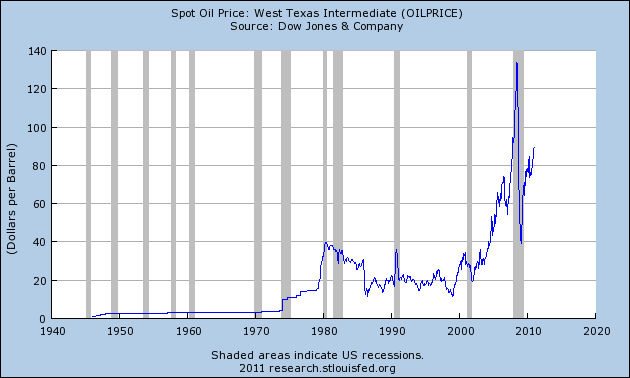 Non-oil exports have ground to a halt: petroleum now accounts for 92% of its dollar intake. Libya revolution has shown how frail is our economy and how even small sized protests in a small but important country as Bahrain can send shock waves all over the world. As more protests are sure to spread to other countries in the region (with Saudi of course being the key domino whose potential fall would send crude well over $200), below you can find some stats on who is who in the vital oil business. All attention is shifting again to developments in Bahrain, which contrary to the media black out, have not been put under control at all. There are also unconfirmed rumors that Al Jazeera may have allegedly received a "request" from Saudi Arabia to not cover recent events in the region and this is another indication of how tense the situation is getting in the Arabian peninsula. A great chart from Reuters which correlates the change of oil prices to the corresponding change in world GDP (indicatively every $10 change in in crude results in an estimated range of 0.5-1.0% inverse change in global GDP). Click on the picture to activate the calculator. Risk analysis firm Maplecroft just released its new fiscal risk index ranking of 163 countries. Europe trumps all other regions with 11 out of twelve courtiers rated as "extreme risk." However, quite surprisingly, only one PIIGS country--Italy which takes the top spot--is in the top 12. The others include many big economies in Europe - Belgium (2), France (3), Sweden (4), Germany (5), Hungary (6), Denmark (7), Austria (8), United Kingdom (10), Finland (11) and Greece (12). Japan at No. 9 is the only other country not in Europe within the highest risk category (See map below). Without significant adjustments, such as raising taxes or reducing spending, countries risk going bankrupt. One such adjustment has already been seen in the UK and Germany where recent government initiatives have increased the state pension age to encourage people to work for longer as a way to alleviate pressure on public finances. Certainly Governor of the Bank of Italy, Mario Draghi had this on his mind when today he addressed during a speech in Verona the current situation of Italy. He clearly stated that Italy has not been growing in the last 15 years, salaries are stuck to 80's levels, the unemployment among the Italian youth has reached 30%, the only support young enemployed italians receive is from their families since no dole or benefits exists for them, the savings base which has always been the backbone of italian families' wealth is being drained by the inevitable costs of supporting the unemployed youth well over their 30th birthday. Furthermore widespread corruption and cronyism are practically rotting the society and make impossible any much-needed reform of the inefficient and corrupted economy. No wonder given the current scenario that Italy is at the top of the international investors' worries. Shock Doctrine, U.S.A., by Paul Krugman, Commentary, NY Times: ...Naomi Klein’s best-selling book “The Shock Doctrine” ... argued that ... right-wing ideologues have exploited crises to push through an agenda that has nothing to do with resolving those crises, and everything to do with imposing their vision of a harsher, more unequal, less democratic society. Allen Park, Michigan, a town of about 28,000, sent layoff notices to its entire fire department. This is a procedural move because the town is unsure how many it will need to lay off. However, the situation looks grim. Providence Rhode Island school district has a huge budget shortfall of $40 million. It does not know how many teachers it will need to layoff so instead, Providence plans to pink slip all teachers.The school district plans to send out dismissal notices to every one of its 1,926 teachers, an unprecedented move that has union leaders up in arms. In a letter sent to all teachers Tuesday, Supt. Tom Brady wrote that the Providence School Board on Thursday will vote on a resolution to dismiss every teacher, effective the last day of school. Detroit has been bankrupt for years. It simply refuses to admit it. Detroit's schools are bankrupt as well. A mere 25% of students graduate from high school. Mayor Bing's latest plan is to cutoff city services including road repairs, police patrols, street lights, and garbage collection in 20% of Detroit. Credit Default Swaps Casino coming soon for everyone! Ever felt excluded from the list of people who can (allegedly) buy insurance on their neighbor's house, and then burn it down? That's all about to change. The CBOE has announced that that on Tuesday, March 8, the Exchange will begin trading newly-designed Credit Event Binary Options (CEBOs) contracts. In essence these will be like Credit Default Swaps, accessible to everyone, which will have a $1000 payoff per contract in the event of a bankruptcy before contract expiration. Credit Event Binary Options contracts allow investors to express an opinion on whether a company will experience a "credit event" (bankruptcy). Due to inverse correlations between credit and equity markets, CEBO® contracts can be used as a hedging tool for individual stocks. The contracts also provide the advantages of price transparency available through a regulated exchange, currently unavailable in over-the-counter credit default swaps markets. A CEBO contract has just two possible outcomes - a payout of a fixed amount if a credit event occurs or nothing if a credit event does not occur. This sudden opening of the market to retail bets on corporate bankruptcy will have huge bilateral repercussions on every single asset class and we can only imagine what will happen when ordinary citizen will start gambling on companies defaults, it seems the race of Wall Street to compete with the Gambling business is taking a new turn, de facto encouraging everyone to bandwagon on the derivatives insanity that has brought us down. International media is getting more vocal on the risks involved in the recent crisis developing in the Middle East. According to Reuters, "Time magazine's intelligence columnist reported on Tuesday that Libyan leader Muammar Gaddafi has ordered his security forces to sabotage the country's oil facilities, citing a source close to the government. In a column posted on Time's website, Robert Baer said the sabotage would begin by blowing up pipelines to the Mediterranean. Should he proceed and destroy the country's oil infrastructure, which exports over 1.5 million barrels of crude a day, mostly to Italy, Europe could face big troubles. Is it clear that future demand for resources, most notably oil is set to trigger conflicts and global tensions in the immediate future. How the West will react to a growing competitor like China which threaten to gobble up the future production is a major key in establishing how the world will evolve in the following years. At the current rates of growth of US and China oil imports and consumption, China's oil consumption will match US oil imports by 2016-2017. China's oil imports and consumption will reach parity with the US by 2021-2022, at which point the US and China will together consume 60% of peak global oil production (assuming 73-75M bbl/day) versus 37-38% today, leaving the rest of the world to adapt to receiving the remaining 40% (35-40% less than is received today). However, at the same trend rates of imports and consumption, the US and China will consume 80% of global oil production by the late '20s to early '30s, leaving the rest of the world just 20% of supplies, and China is on track to consume the entire world's oil production by the '40s-'50s; needless to say, this cannot occur. Eventful months approaching. The outcome of the Hamburg election is nothing short of a disaster for Angela Merkel and her ruling CDU party. Bloomberg reports that "Chancellor Angela Merkel’s party lost control of Hamburg, Germany’s richest state, in the first of seven state votes this year and this threaten to limit her ability to respond to Europe’s debt crisis. The CDU took less than half its tally at the last Hamburg election three years ago. The results are “painful” for the CDU, Mayor Christoph Ahlhaus said in comments broadcast live, congratulating his Social Democratic opponent Olaf Scholz, a former Labor Minister in Merkel’s first-term government. Irish elections are next this week and the current debate on the renegotiation of the bailout deal is not promising any respite to the current market volatility. Sinn Fein said it would seek a referendum on the euro rescue deal, which would put the entire banker rescue operation codenamed "Dublin" in jeopardy. Party President Gerry Adams said the country could not afford to draw down the 85 billion euro loan. Italy is on the brink with its Prime Minister indicted for child prostitution and set to stand trial in April. The Italian Government is wobbling and early election could materialize in springs. Investors are nervous about Italy. Even before the financial crisis, Italy’s growth rates lagged behind those of its European peers, sunk by pervasive corruption and burdensome bureaucracy at every level of government. It needs a credible government that can ask for tough sacrifices at home, patience from creditors abroad and support from other European governments. Italy has one of the highest absolute debt levels in the euro zone and meeting its refinancing needs for the next three years would cost in excess of 800 billion euros. At around 118 percent of gross domestic product, Italy's public debt is the second highest in the euro zone after Greece. The western corner of Saadiyat Island has been designated as Abu Dhabi's cultural district. That almost understated description belies the ambition behind the project. This is a cultural district like no other. Over the next five years, Saadiyat's skyline will be transformed by a succession of hugely prestigious landmarks, piloted by some of the world's leading architects: a Guggenheim Museum designed by Frank Gehry; the Louvre Abu Dhabi designed by Jean Nouvel; a performing arts center by Zaha Hadid; the Zayed National Museum designed by Norman Foster; and a Maritime Museum by the Japanese master Tadao Ando. It will be the world's largest single concentration of cultural institutions of this caliber. This is a country that is becoming used to making statements through superlatives and records. It is hoping to attract millions of visitors who will help support an economy that is, some would say, dangerously dependent on just one source, its oil revenue (pessimists predict a fall in the region's oil production within 15 to 20 years). The Saadiyat development, estimated at $27 billion, will also include luxury resorts, golf and beach clubs, and a nature reserve. But Saadiyat is more than a tourist initiative. The implications of its successful development are potentially more profound than that. The cultural district project aims to redefine and reposition Abu Dhabi's place in the world. How to block Internet during a revolution. The U.S. national debt is currently $14,081,561,324,681.83. It is more than 14 times larger than it was back in 1980. Unfortunately, the national debt continues to grow at breathtaking speed. In fact, the Obama administration is projecting that the federal budget deficit for this year will be an all-time record 1.6 trillion dollars. As tens of thousands of U.S. factories get shut down and as millions of jobs get shipped overseas, the number of unemployed Americans continues to go up and up and up. 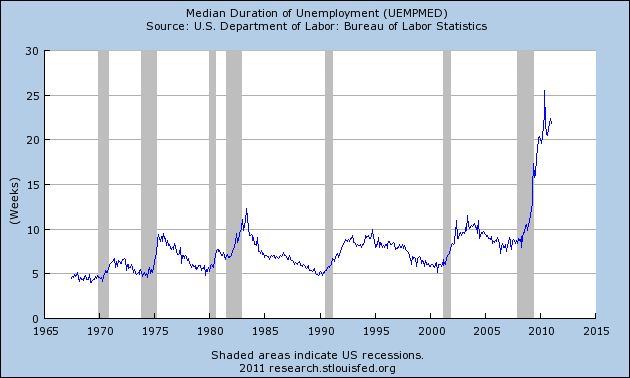 As you can see from the chart below, there has been a long-term trend of increasing unemployment in the United States. 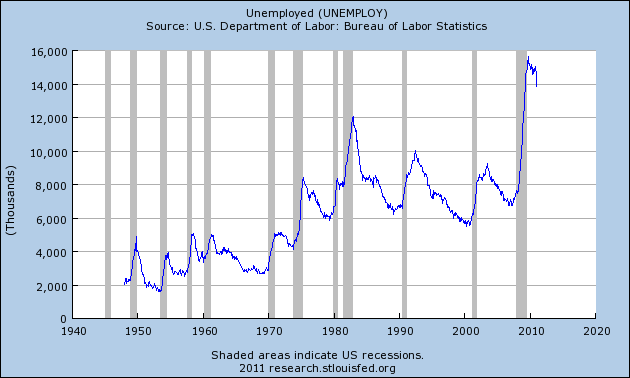 In fact, there are about 3 and a half times as many unemployed workers in the United States today as there were when 1970 began. All of the major trends in global trade are very bad for the U.S. middle class. For example, the U.S. trade deficit with China for 2010 was 27 times larger than it was back in 1990.